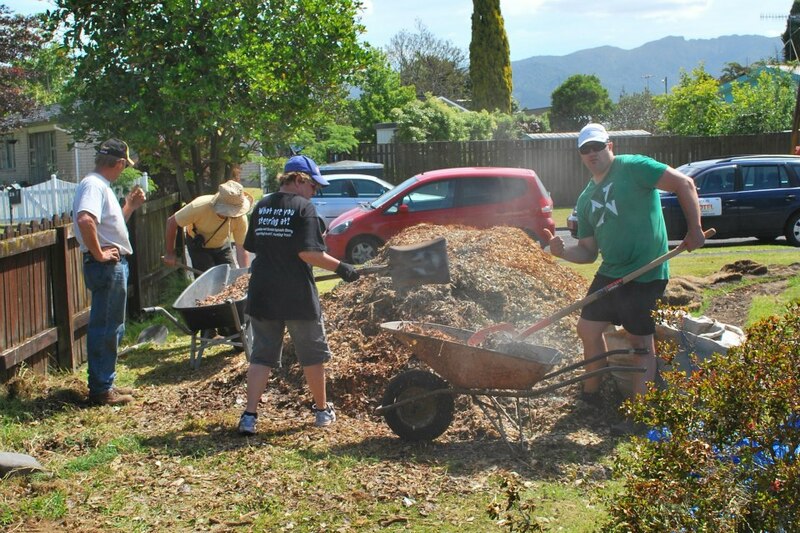 Permablitz Central North Island | Blitzing the Central North Island one garden at a time! Permablitzes are free events, open to the public, with free workshops, shared food, where you get some exercise and have a wonderful time. To be defined as a permablitz, each event must also be preceded by a permaculture design overseen by a designer with a Permaculture Design Certificate (PDC) the most basic permaculture qualification. The permablitz concept can be used by anyone. Based on the concept of reciprocity, taking part in a permablitz is a great way to learn a range of organic gardening and sustainable living skills and to meet others with similar interests. Blitz days are a team effort to install or add to an edible garden, a bit like the Amish barn raising model. Here in the Central North Island, Permablitz is a network of keen people that help each-other to establish edible gardens based on permaculture principles. First give a little, then get a lot in return. We recognise that setting up a highly efficient sustainable garden is the same! Permablitz leverages the power of teamwork and magic of permaculture to changes lives! We’re a network of givers that practice manaakitanga ( care of people) , kaitiakitanga (care of the earth) and whanaungatanga (kinship through shared experiences). Others know this as reciprocity, which means giving in order to later receive from the abundance created for the whole community. Get involved, learn, be patient and give fairly. A blitz at your house will be well deserved and potentially reward you for years with an abundance of healthy food for minimal effort! If you have been to a few permablitzes, we can help organise one at your house. That’s right. The permablitz network is based on reciprocal volunteer support. When your’e ready, we can help connect you with a permacultre designer, help you plan your blitz, promote it, and co-ordinate it on the day. see our Get Blitzed section. Before a blitz happens, a host works with a permaculture designer to prepare their garden design. Some use volunteers, others choose to find a professional designer. Once a plan is ready, the hosts start gathering plants and materials. Some possible dates for the big day are chosen several weeks ahead. The designer then arranges some volunteer leaders to help on the day. Once all agree, a blitz announcement is made here on the website. The host then readies the site and the food for the day. Registrations are taken, the blitz details are sent out and,… hey presto ….Permablitz! Permaculture is a design system which helps integrate people and place in ecologically harmonious systems providing a good portion of the needs of people living there. Who co-ordinates Permablitz Central North Island? Behind the scenes, Permablitz Central North Island is a network of volunteers too. The Permablitz Designer’s Guild is made up of permaculture designers and student volunteers that design gardens for blitzes and actively provide leadership to run them . Learn more about the Designer’s Guild and who co-ordinates it on the behind the scenes page. Join us to recieve email from this website whenever a blitz announcement is posted. You can manage (un-follow) at any time. Enter your email and click Join us. You'll recieve a confirmation email which you'll need to click on the link to confirm. Blitzing the Central North Island one garden at a time! A sustainable system is one that keeps going when external inputs of non-renewable resources are turned off.Our current mode of food production, namely industrial chemical and fossil fuel dependent monoculture, is not sustainable. We know the problems and we have the solutions. It is time to transition not just from denial to awareness, but from awareness to action. Let’s go!